The ultimate football fantasy involves throwing a last second Hail Mary pass into the endzone that ends up winning the Super Bowl. Such a fantasy usually requires you to have an NFL-caliber throwing arm, but the winged Raptor Football promises to give quarterback-like capabilities to almost anyone. Now we just need it approved by the NFL. 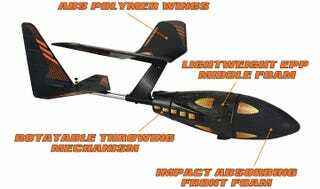 Looking like a cross between a toy glider and a football, the Raptor relies on a light but strong polymer wing to soar across a football field. 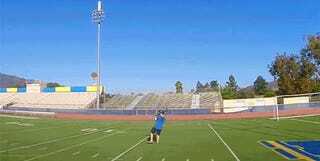 Its creators claim the average person can easily throw the Raptor over 100 yards, or the entire length of a field, which is farther than even an NFL quarterback can muster. Don't get too cocky, though, because odds are the NFL isn't going to be adopting the Raptor any time soon. Before you can start throwing amazing 100-yard touchdown passes, the Raptor Football needs your help to raise $193,000 on Kickstarter. That's a lofty goal, but you can help its creators creep closer and closer to it with a $29 donation that secures you one of the first Raptor Footballs to roll off the production line.